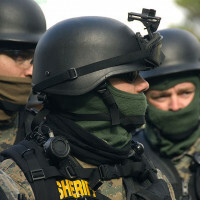 Bob Owens is reporting the Obama Administration has announced restrictions on the federal program to deliver surplus military equipment to police departments. I have mixed feelings about this. On the one hand, I do tend to think making the department go to their civilian overseers for approval is not unreasonable. On the other hand, I think it’s not a bad thing, generally speaking, for this equipment to end up widely distributed to local communities, rather than just setting in federal government warehouses. Even if you’re a real wookie suiter “insurrectionist,” it’d be a hell of a lot easier to liberate equipment from your local PD than it would be from the feds if the S were to ever HTF. Regarding your line about liberating ex-military gear from a local PD when TEOTWAWKI occurs. Given my third world upbringing, the first thought that occurred to me was that having ex-military gear sitting in the local PD motor pool is a fine start for a local warlord taking over your community. I would rather try liberating that stuff from a lightly staffed N.G. Armory first, then go looking for an ASP before I deal with said prospective warlord. It’s extremely rare for me to agree with whatever this president wants. But in this one situation, I too have reservations issuing this sort of military gear to local law enforcement. Perhaps an APC without a turret mounted MG would be OK, but definitely not Select Fire Weaponry. And definitely not explosives to the Philadelphia PD. I rather expect that by the time things got that far, the stuff in the N.G. Armory would already be in use by the N.G., and not sitting in the Armory any more. Of course, the police will already be using theirs, too, but they’re more likely to stay local than the N.G., who could end up hundreds of miles away. So the town I live in here in Oklahoma (unnamed, population maybe 15k) bought an MRAP from the DOD lease program, and only had to pay a couple thousand dollars for the transfer costs. The PD was able to do this without the City Council barbecue they used their drug seizure funds. It’s pretty much the anti-libertarian double whammy we got goin’ there. At any rate, nobody is talking about ongoing maintenance for said MRAP, specialized part, tires, diesel fuel, and on and on. If they ever use it for more than parades, I reckon it’s going to cost them a bit more than their inital outlay of seizure slush fund money. Completely agree, but I don’t see this happening until we dry up the seizure slush funds vi civil asset forfeiture reform laws, or other legislation that enhances local oversight. Laying down the groundwork for a Democrat push for banning of .50 caliber guns? If they’re weapons of war the police shouldn’t have, should civilians? I’d be thrilled if the Democrats took that position. The Dems have only been successful with gun control when they’ve been able to pit the FOP against us. Clinton managed that by buying them off. Obama doesn’t have the cash or inclination. If Obama moved in that direction, we’d have the cops fighting with us rather than against us. This may have been a reference to the SC Sheriff who received a surplus tracked APC with mounted M2 .50 HMG. I would humbly submit that it should not be a matter of disagreement that the Ma Deuce has no legitimate law enforcement function. I disagree: They’re a wonderful deterrent. No sane person is going to try to loot/pillage/burn the street that has a guy running overwatch with an M2 MG. Call out the Guard in that case. I will say this again…crew served weapons have no legitimate police purpose, even in cases of mass riot. It’s a bright line. Once posse comitatus no longer applies (which is itself a bright line), you can use them. We’re approaching the same point from different sides; basically. Until and unless the use of military personnel is justified, the sue of crew-served/heavy weapons is not justified. In Common Law, that’s what the reading the Riot Act means, of course; that the line has been crossed. Civilian “militia” or government police force, I strongly believe there is a phenomenon I’ve coined “All Dressed Up with No Place to Go.” Too often, given the accoutrements of a military force, people in a group will cobble up an excuse to use it. I should also stipulate that I have some suspicions about the motivations of many people who aspire to be cops these days, but that’s another, arguable subject. But over nearly seven decades, I have never encountered a police officer who could tolerate being said “no” to, without taking it very personally. I’d much rather the feds dispose of their surplus by just selling it. I agree that if an organization gets a neat toy, the temptation to play with it is going to be irresistible. That’s why I really like the language used by the house amendment to the NDAA: The talk is all about saving the Army money by allowing them to transfer their surplus 1911 pistols to the CMP, but the actual language of the amendment isn’t limited to just 1911 pistols. It says “firearms” and “surplus firearms” but I didn’t see anything to specifically define these; I would argue that the definition from the tax code could legitimately be applied. Comments about paying for goods with out Vivian over sight reminds me of the m fund the military had. I’m in agreement our locals don’t need more toys, they are undertrained on the basics of safety & marksmanship; bigger toys mean bigger mistakes. For example, I seem to recall a 15 ton MRAP on it’s side in the AZ desert a few months ago, flipped on it’s way to a new home. The downside? I also see this as the perfect lead in to developing a national police force, a SWAT team to end all SWAT’s. Imagine a Ferguson protest where the police can’t maintain control. Don’t worry, we’ll send in our guys says the fed (another branch of the TSA of course). The governor says hell yeah: no cost to his state (unlike the NG), if it goes south it’s not on his shoulders, and the police aren’t local, so they have no reservations about digging their heels into necks of the citizenry.